Large trucks traveling at high speeds with heavy cargo can easily cause serious injuries and wrongful death when drivers are reckless, cargo loaders are careless or owners are negligent. Because of the inherent risk in transporting cargo, in The Bronx carriers are generally required to carry large amounts of insurance. This ensures that accident victims have access to the compensation they need following serious injuries. If you or a loved one has been injured in a commercial truck accident, contact The Bronx commercial truck accident attorneys of The Orlow Firm. We have represented clients in truck accidents since 1981. In too many cases in The Bronx, our investigations reveal that the negligent truck drivers only recently received their commercial driving licenses (CDLs) and are “learning on the road.” Other common problems include poorly maintained trucks, or drivers with a history of traffic violations and drunk driving. If you have been injured in a commercial truck accident, do not risk losing the compensation you deserve. 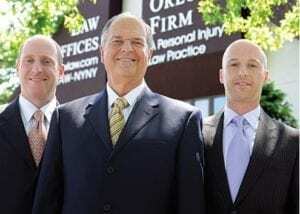 Contact The Bronx commercial truck accident attorneys of The Orlow Firm for experienced personal injury representation. We offer free initial consultations and operate four offices across New York City for your convenience. We can go to you if you cannot come to us. To contact a lawyer, call (646) 647-3398.